Can we change the size of the document in Microsoft Word? 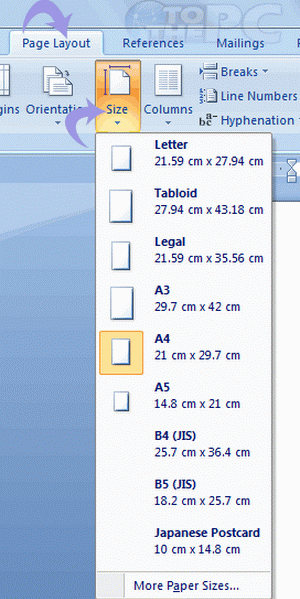 The default paper size in MS Word is A4 (21 cm X 29.7 cm) and this can be easily changed as per user requirement. There are number of standard size options like letter, tabloid, legal, B4, B5, postcard and many more to choose from. 1. Launch Microsoft Word 2007 or 2010 on your computer. 2. Go to Page Layout ribbon and click on Size icon. 3. A drop down menu will show up with all the sizes that are available in Word 2007. Just select the size that you want. All the pages in the document will be set according to the selected size.